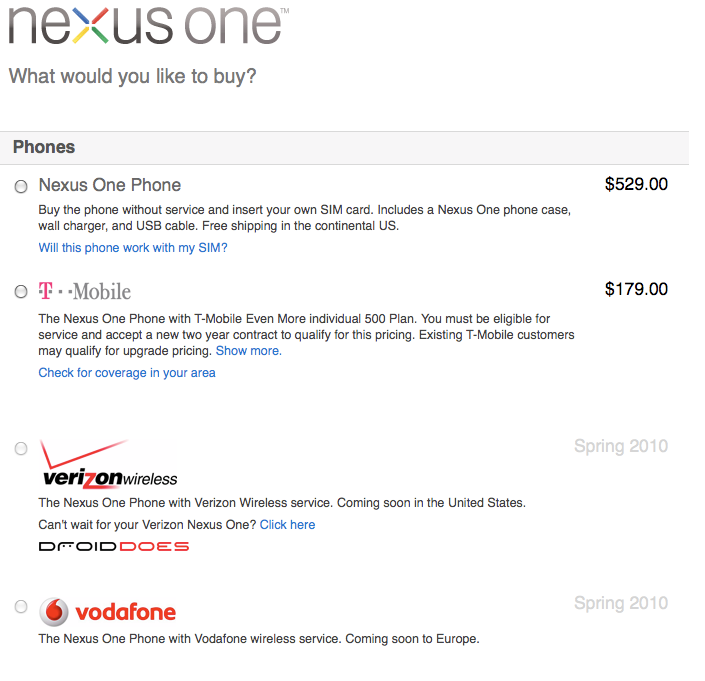 As expected, customers can purchase a contract-free, unlocked Nexus One smartphone direct from Google for $529, or buy a subsidized handset through carrier T-Mobile for $179, the search giant announced Tuesday. Through the Google Web store, customers will be able to buy a phone without service, or with service through a partner. Phones with a service contract will be offered at a subsidized, less expensive price. As of Tuesday, customers can purchase a phone only with T-Mobile, though that will soon change. Google also plans to offer more Android-based devices to its online store in the future, for other carriers like Verizon Wireless (in the U.S.) and Vodafone (in Europe). 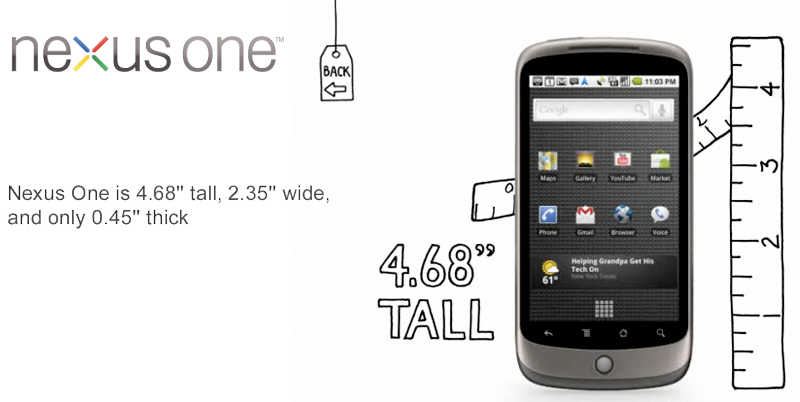 The Nexus One will be available on both carriers in Spring 2010. The Web site google.com/phone went live immediately following Tuesday's press conference. 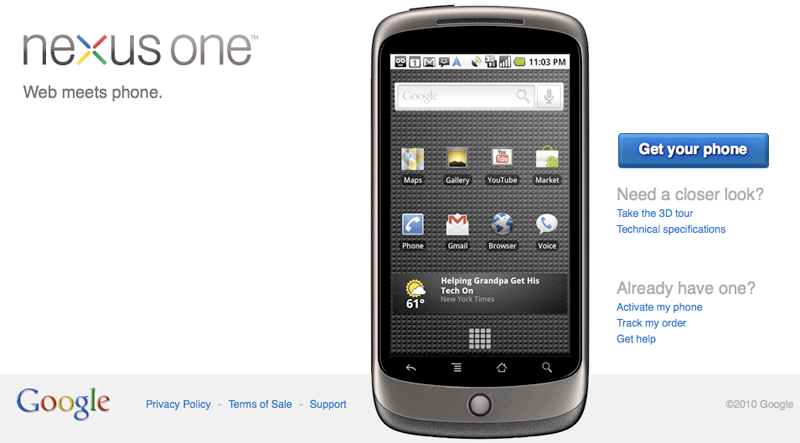 There, users can now purchase the Nexus One for T-Mobile U.S., or unlocked. Options for Verizon and Vodafone are grayed out, though those who "can't wait" for the Nexus One on Verizon are directed to a promotional Web site for the Motorola Droid. Beyond that, more operators, countries and Android-based devices are planned to be sold from Google's online store. But Tuesday, most of the focus was on the company's custom-built handset. Google worked closely with hardware maker HTC to design the Nexus One, which features a 3.7-inch AMOLED touchscreen. Though the phone can be purchased unsubsidized and unlocked through Google, the current GSM handset is only compatible with T-Mobile and AT&T in the U.S., and its 3G chip is not compatible with AT&T's high-speed wireless data network. A CDMA Verizon phone is due for a Spring 2010 release. With the tagline "Web meets phone," the official unveiling of the Nexus One Tuesday brought to an end months of rumors that Google would release its own custom-built Android phone in early 2010. Those reports gained steam in December when the company issued unlocked GSM Nexus One phones to its employees. The HTC-built device has a 1GHz Snapdragon CPU and 512MB of ROM and 512MB of RAM. It has a compass, GPS, light and proximity sensors, an accelerometer, and a 5-megapixel camera with LED flash. It also features an additional microphone on the back for noise cancellation. Google boasted that the handset is no thicker than a number two pencil, and no heavier than a Swiss Army knife. Much like Apple users have been able to do with iPods for years, the Nexus One can also be custom engraved on the back for personalization. The touchscreen device has no physical keyboard, only virtual, but offers a voice-to-text feature that allows users to dictate aloud for any text field on the device. The handset runs the unreleased Android 2.1 operating system, which has new home screen visual enhancements like animated and interactive desktop wallpaper. One early review noted that while the handset is a decent smartphone, it is not an "iPhone killer." Unlike the iPhone, it does not have multi-touch. At its event Tuesday, Google highlighted the news and location-aware weather widgets from Android 2.1. It also demonstrated an animated wallpaper that allowed users to make ripples on water with their finger. In an effort to calm some concerns that Google would be competing with its partners in the Android Open Handset Alliance, the Mountain View, Calif., company highlighted 13 new members that have joined the alliance Tuesday. The total number of OHA members is currently 52. In all, there are more than 20 Android devices on 59 carriers in 48 countries. Google officials said they will focus on specific projects with partners, such as the Motorola Droid, to encourage innovation in the marketplace. The availability of the Nexus One first on T-Mobile signifies the ongoing partnership between the nation's fourth-largest wireless carrier and Google. The first Android phone, the T-Mobile G1, debuted in Oct. 2008 with a $179 price tag. Since the G1 debuted the Android platform, it has expanded to numerous devices, most notably the Motorola Droid. The Verizon-only handset launched in November to favorable reviews.